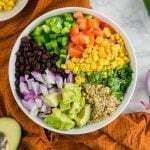 Whether you need an easy side dish to bring along to a potluck or for a weeknight dinner, this southwest quinoa salad with black beans and corn is the perfect recipe for you. 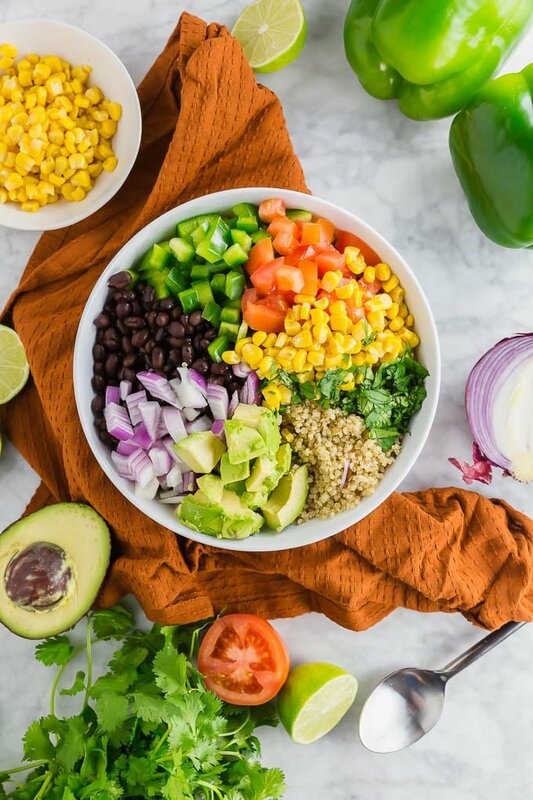 With zesty lime dressing and loads of avocado, black beans, corn, cilantro and red onions, you really can’t go wrong with this quinoa salad. It’s naturally gluten-free, dairy-free and vegan, too! When the weather gets warmer, I love to make side dishes for my meals that can be served cold. All the better if they’re easy to make ahead, too. This southwest quinoa salad is a great recipe for meal prep or for entertaining a large crowd. It pairs so well with so many different proteins, from steak to salmon to tofu! There are so many fresh ingredients in this southwest salad, but it still takes almost no time to prepare at all. While the quinoa is cooking on the stove, you can chop up the vegetables and whisk up the lime dressing to toss it all together. 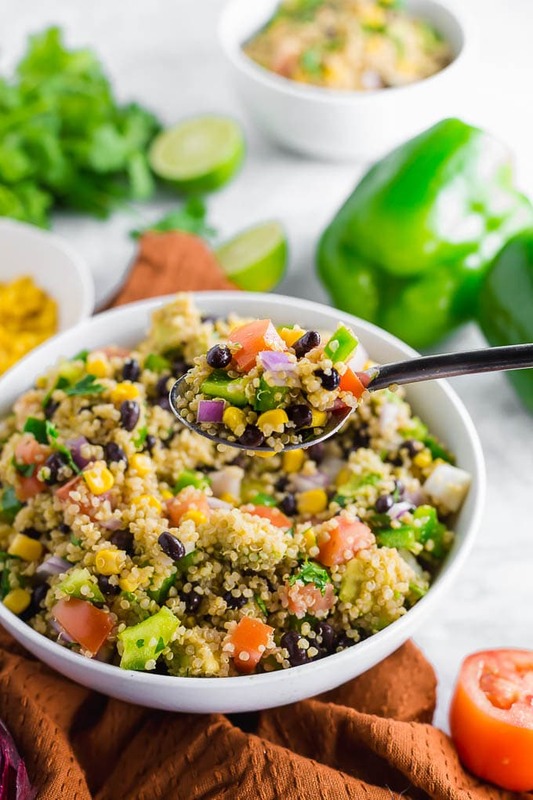 In this simple quinoa salad recipe, quinoa is mixed with black beans, corn, tomatoes, and red onion. Then it is tossed with chopped cilantro and lime dressing and refrigerated to let the flavors meld together. Once you’re ready to serve, you just add in the diced avocado. It’s that easy! The part that takes the longest for this quinoa salad is cooking the quinoa on the stovetop, which is actually so simple. The typical ratio for cooking quinoa is 1 cup of quinoa for every 2 cups of liquid. Many people cook their quinoa in water, but I find that the quinoa is so bland when cooked with water. Since the quinoa is the star of this southwest quinoa salad, we really want the flavors in the quinoa to shine. Instead, I like to cook my quinoa in vegetable or chicken broth instead of water. The quinoa absorbs SO MUCH liquid while it cooks, that it’s also absorbing so much flavor from the broth. Trust me, once you cook your quinoa in broth, you won’t go back to using water again! Quinoa takes just about 15 minutes to fully cook, so it’s really a great option for this easy side dish. My favorite recipes are those that can be made ahead for healthy lunches throughout the week or for bringing along to a party. No one wants to be cooking on the day of a party right? This southwest quinoa salad is the perfect recipe for a make ahead side dish. One of the best ways to make it ahead is to prepare a day or so ahead of time and let sit in the refrigerator. You want the flavors to combine anyways, so this is a fantastic option. I would leave out the avocado until you’re ready to serve since avocado can quickly turn brown. As I’ve already mentioned, this black bean quinoa salad is so versatile and pairs amazingly with so many different proteins. It would be especially delicious with my Honey Glazed Salmon with Avocado Mango Salsa. You can also serve it along side chicken thighs for a quick weeknight meal. My Roasted Chicken Thighs are so crispy and tender that if I ever have some last minute guests stop by, these are my go-to recipe. Everyone loves them! Full of black beans, corn and avocado, this southwest quinoa salad is a great side dish for potlucks and weeknight dinners alike. It’s a great dish for when you don’t want to turn on the oven, and it’s gluten free, dairy free, and vegan. 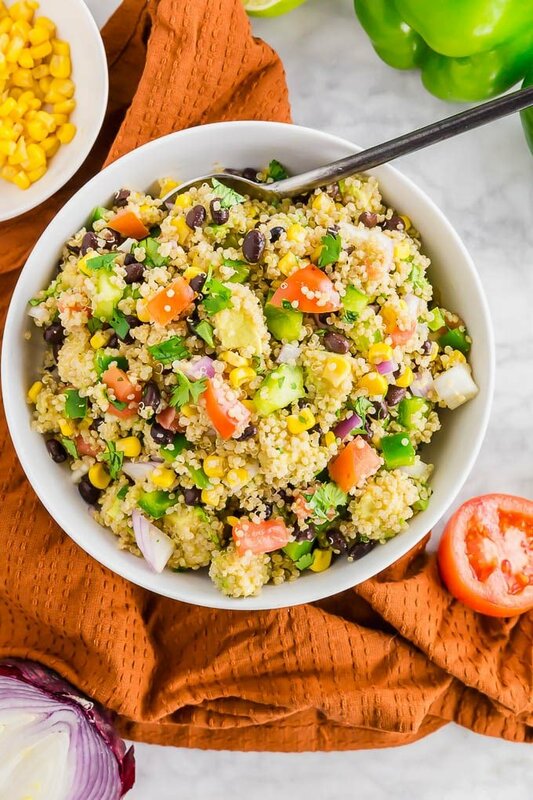 Whether you need an easy side dish to bring along to a potluck or for a weeknight dinner, this southwest quinoa salad with black beans and corn is the perfect recipe for you. 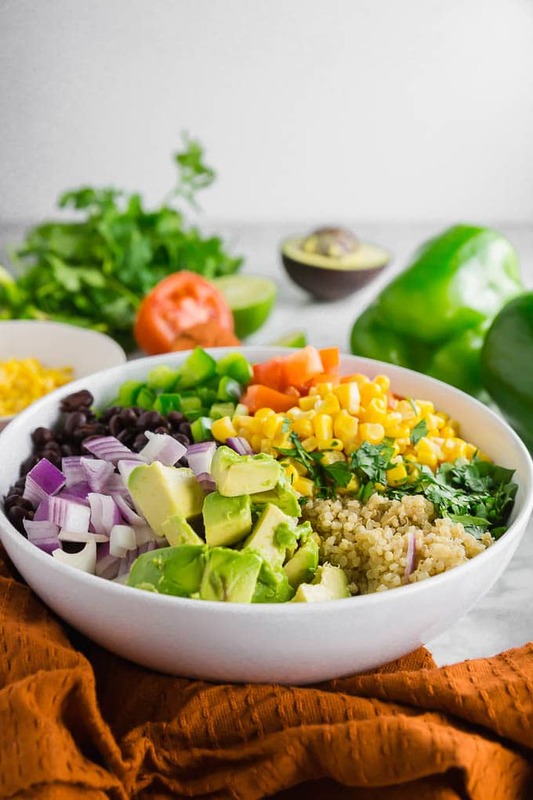 With zesty lime dressing and loads of avocado, black beans, corn, cilantro and red onions, you really can't go wrong with this quinoa salad. It's naturally gluten-free, dairy-free and vegan, too! Add quinoa and vegetable broth to a medium saucepan over medium high heat. Bring to a boil. Once boiling, turn the temperature to low and cover with a lid. Let the quinoa simmer for 15-20 minutes, until the quinoa has soaked up all the broth. Remove the quinoa from the heat and fluff with a fork. Let cool completely. Add the cooked quinoa to a large bowl with the black beans, corn, bell pepper, tomatoes, red onion and cilantro. Set aside. In a small bowl, whisk together lime juice, olive oil, salt and black pepper. Pour the lime dressing over the quinoa and toss until coated. Let refrigerator for at least an hour or ready to serve. Before serving, toss with diced avocado.